Oral solution. Powerful natural product that maintains optimal health. 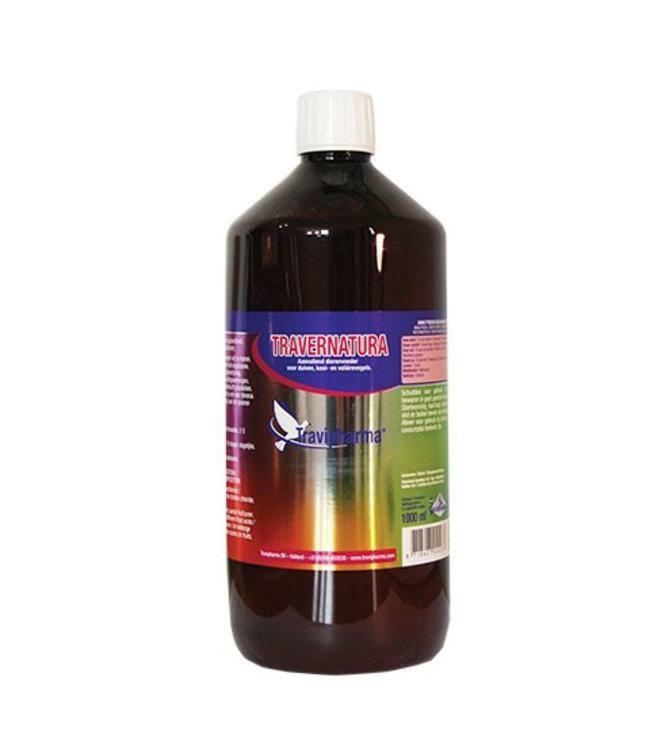 Travernatura is a powerful natural product that maintains optimal health in your colony. This elixir contains minerals and trace elements in a powerful fruit acid. This product maintains the pigeon in top condition and keeps the throats clear. It is advisable to use Travernatura for breeding pigeons who do not exercise to prevent fatty liver. For oral administration through the drinking water. Shake well before use. Pigeons: 5 ml per 1 litre of drinking water. During 2-3 consecutive days a week. Youngsters, the first 14 days daily administration. After that, three days a week (can be given daily). Weaned youngsters; Administer Travernatura 14 days continuously, to prevent relapse. Bathwater Add 10 ml Travernatura per 5 litres to maintenance a better feather condition. Birds: 2.5 ml per 500 ml of drinking water. With young birds, the first 14 days daily administration. After that, three days a week (can be given daily).